As a devotee of stimulus, the President should appreciate that tax breaks for corporate jet purchases help stimulate people to buy such aircraft, which in turn help employ 1.2 million domestic workers and generate $150 billion. Then again, maybe the President just resents the fact that free people in an open market can do a better job stimulating the economy than government experts. Economists projected that the U.S. economy would add 160,000 new jobs last month. Instead, the Labor Department announced today that we only added 69,000. Additionally, the unemployment rate increased to 8.2% in May from 8.1% in April. That makes 40 consecutive months above 8%, a new record. Keep in mind that the Obama Administration claimed we wouldn’t reach 8% in the first place if his failed “stimulus” spending bill passed back in early 2009. This announcement also arrives one day after the Commerce Department announced that the American economy grew only 1.9% in the first quarter of 2012, short of its initial 2.2% estimate. More broadly, the economy must add 200,000 jobs each month just to keep pace with population growth and materially reduce the unemployment rate, and today’s report follows a disappointing 115,000 number in April. The Obama Administration claims that the last recession was “the worst since the Great Depression,” but that’s false. The early-1980s recession was substantially worse – higher unemployment, higher inflation and higher interest rates. President Reagan’s policy of lower taxes and less regulation, however, rapidly reduced unemployment from 10.4% to 6.7% in the three years following the effective date of his tax cuts in January 1983. In contrast, Obama’s policies of higher spending, higher deficits, higher taxes and more regulation have caused the worst cyclical recovery since the Great Depression. Ask Obama: Whose Idea Was That? But Obama was not exactly a man without a team. He was loyal to the cult of policy smarts. He may have even been its high priest. As Scheiber reports, outside analysts reporting to the president were advised to highlight their expert credentials so he would know he wasn’t talking to cranks and dummies. Obama also wanted his inner circle to credit his own abilities: The president, Scheiber writes, “craved intellectual affirmation” and often badgered his lieutenants into acknowledging when his own ideas were perceived to have succeeded. Obama “had a habit of prompting his aides to acknowledge his wisdom and foresight,” Scheiber writes. The president would sometimes wonder aloud, “Whose idea was that?” when he deserved credit. Whatever is Obama’s conscious motivation for overemphasizing credit and credentials at every turn, this window into his personality reveals a deeply insecure person. Remember, this is the same man who’s boasted about being a better campaign manager than the one he employs, a better speechwriter than his scribes, and so on. If this is the way the President wants to play it, why not let him own every decision by his administration? $787 billion in stimulus spending and no change in the unemployment rate – Whose idea was that? A federal takeover of the health care industry that raises the deficit while reducing services – Whose idea was that? Selling thousands of guns to Mexican drug cartels so they could be traced to crime scenes – Whose idea was that? It’s been said by some supporters of President Barack Obama’s $787 billion stimulus spending spree that we can’t really know if it failed because we can’t ‘re-run’ the last three years to see if something else might have worked. But according to economist John Lott, we don’t have to. In a wide-ranging interview with The Daily Caller about his new book, , Lott compares the different approaches by the liberals in Debacle: Obama’s War on Jobs and Growth and What We can Do Now to Regain Our Future the Obama White House and the conservatives running Canada’s government. The results aren’t pretty. How do we know the stimulus package made the economic situation worse? Compare the U.S. and Canada. Their unemployment rates increased in lock step from August 2008 until six months later, in February 2009, when the stimulus was passed in the United States. During those six months, the U.S. unemployment rate rose by 2.1 percentage points, from 6.1 percent to 8.2 percent, and the Canadian rate grew by 1.9 percentage points, from 5.1 percent to 7 percent (using the BLS [Bureau of Labor Statistics] measure to make the Canadian measure of unemployment comparable to the U.S. rate). The graph that we have showing this is actually stunning. Canada adopted a much smaller and quite different “stimulus” program that emphasized cutting tax rates and regulations and that produced dramatically smaller deficits. On a per-capita basis, Canada’s stimulus was about a third that of America’s, costing $979 per person compared to our $2,730. The conservative Canadian government chose not to introduce any big programs. Obama, meanwhile, adopted big-ticket Keynesian programs, believing that government spending for its own sake creates wealth. But Democratic emphasis on “green” energy, government-approved investments and technology and higher salaries for public-school teachers merely moved money away from where Americans and companies would have otherwise spent it. Obama’s stimulus also raised the effective marginal tax rates that some individuals face, discouraging work; Canada, by contrast, cut some marginal rates. Obama kept the corporate tax rate stuck at 35 percent, while Canadians cut their corresponding rate from 21 percent in 2007 to 16.5 percent this year — with a further cut to 15 percent planned for next year. By last year, Canada had the lowest overall tax rate on business investment of any major industrialized country. Canada also didn’t run the huge stimulative deficits that we ran here in the U.S. They didn’t saddle their kids with a huge debt that they were going to have to pay off. But if Obama’s program — including a massive 21 percent hike in spending from 2008 to 2011 and corresponding massive deficits — worked so well, why has our unemployment rate risen more since those policies were adopted than have the rates of the European Union, South America, Japan, Australia or New Zealand? Every week or so it seems there’s another story out of Washington about the federal government spending an eye-popping amount of money on something that’s either dramatically overpriced or outright unnecessary: $115,000 a year for someone to update the Interior Department’s Facebook page, for instance, or the Maryland town where more than $800,000 of stimulus money was spent in order to publicize how well stimulus money was being spent. Perhaps, in a fit of rage at one of these stories, you’ve wondered why there isn’t a government watchdog tasked with reining in these expenditures. Though it’s little know outside of Washington, there actually is such an organization, the colorlessly named General Services Administration (GSA), which describes its mission as “to use expertise to provide innovative solutions for our customers in support of their missions, and by so doing, foster an effective, sustainable, and transparent government for the American people.” And now the head of the organization, Martha Johnson, is stepping down after the GSA went on a taxpayer-funded spending binge. GSA’s Public Buildings Service spent $822,000 on the biennial Western Regions Conference in Las Vegas for only 300 employees, according to an inspector general’s report. The expenses included $147,000 for airfare and hotel lodging for six planning trips by conference organizers. That figure included $100,000 on two “scouting trips” and five off-site meetings and an additional $30,000 on catering costs for those trips, according to the report. Among the other expenses were $3,200 for a mind reader; $6,300 on a commemorative coin set displayed in velvet boxes; and $75,000 on a training exercise to build a bicycle, according to the IG report, which was obtained by Federal Times. GSA also promised the hotel an additional $41,480 in catering charges in exchange for the “concession” of the hotel honoring the government’s lodging limit. The agency also spent $44 a person per breakfast and $95 per person for its closing reception dinner. The agency also spent money on mementos for attendees, clothing for GSA employees and tuxedo rentals, according to the report. The GSA: Looking out for the taxpayers since 1949. But who will watch the watchmen? h/t — Mollie Hemingway at Ricochet. One Month Sufficient Lead Time for “Stimulus,” But Three Years Insufficient for Keystone XL Pipeline? Today’s Department of Labor report that unemployment declined slightly from 8.5% to 8.3% in January will surely be celebrated and trumpeted by the Obama Administration. Which only serves to illustrate the terrible quality of his economic performance in office. First of all, today’s announcement means that unemployment has now exceeded 8% for 36 consecutive months, three entire years. That’s an all-time record since recordkeeping began. Second, that new record is not somehow a reflection of the fact that the most recent recession was “the worst since the Great Depression,” as Obama and his apologists constantly claim. Unemployment actually reached a higher peak in the early 1980s recession, but quickly plummeted from 10.8% to 6.7% following implementation of Reagan’s tax cuts. In contrast, unemployment has increased under Obama from 7.8% to over 10% and three straight years over 8%. Moreover, inflation and interest rates were far higher in the early 1980s recession, and monetary policy was much tighter, meaning that conditions were less hospitable for economic improvement. Third, for all of the deficit spending the Obama Administration heaped upon American taxpayers, it promised that unemployment under its agenda would be down to around 6% by now. Instead, we’re barely treading water and mediocre news is characterized as wonderful. This is the Age of Obama. When Barack Obama entered office and proposed his nearly $1 trillion spending “stimulus” bill, his administration promised that unemployment would peak at 8% in the fall of 2009 if we passed his plan. They also predicted that unemployment would be down to approximately 6% by now. Instead, following today’s latest report from the Department of Labor, unemployment has now exceeded Obama’s promised 8% ceiling for a record 34th consecutive month. Although some will focus on the decline from 9.0% to 8.6%, most of that statistical decline is due to people giving up and dropping out of the labor force, rather than from sudden job creation. That is illustrated by the fact that only 120,000 net jobs were added, less than the anticipated number. That’s also fell far below the 200,000 new jobs needed each month to reduce the unemployment rate by just 1% over the span of a year. Additionally, the broader labor participation rate again declined and now stands at 64%. In contrast to the destructive effects of Obama’s borrow-and-tax-and-spend agenda, Ronald Reagan’s tax-cutting agenda saw unemployment plummet from 10.4% to 7.1% over the same period of time. As the old Latin saying goes, “res ipsa loquitur” – the fact speaks for itself. The nation’s unemployment remained at or above 9% again last month, and has now exceeded 8% for 33 consecutive months since February 2009. That’s the longest stretch since the federal government began issuing monthly reports in 1948. Here’s why that 8% benchmark and February 2009 are important. When Obama passed his nearly $1 trillion “stimulus” bill that same month, his administration projected that unemployment would never exceed 8%, and be all the way down to approximately 6% today. Instead, unemployment quickly climbed to 10.1%, and has remained above 9% for all but four months during that record 33-month span. Moreover, the economy only added a disappointing 80,000 jobs for September, less than the expected 100,000 and far below the estimated 200,000 necessary each month to reduce the rate by just 1% over the course of a year. It’s instructive to compare the real-world results of Obama’s economic agenda with Ronald Reagan’s. In the same 33-month stretch following the effective date of Reagan’s tax cuts, unemployment plummeted from 10.4% to 7.1%. The comparison speaks for itself, yet now Obama tells the nation that what we need is more of the same – more “mini-stimulus” government spending. Obama’s agenda has demonstrably failed, and it’s time to return to what demonstrably works. Unemployment remained unchanged at 9.1% last month, and has now exceeded 8% for 32 consecutive months since February 2009. That’s the longest stretch since the federal government began issuing monthly reports in 1948. And there’s a reason why that 8% benchmark is important. When Obama passed his nearly $1 trillion “stimulus” bill that same month, his administration projected that unemployment would never exceed 8%, and be all the way down to approximately 6% today. Instead, unemployment quickly climbed to 10.1%, and has remained above 9% for all but two months in that record 32-month span. Moreover, the economy only added a lackluster 100,000 jobs for September, far below the estimated 200,000 necessary each month to reduce the rate by just 1% over the course of a year. Compounding that depressing figure, keep in mind that approximately 45,000 of the jobs that were added came as a result of Verizon employees returning to work after striking in August. It is helpful to compare the real-world results of Obama’s economic agenda with Ronald Reagan’s. In the same 32-month stretch following the effective date of Reagan’s tax cuts, unemployment plummeted from 10.4% to 7.1%. The comparison speaks for itself, yet now Obama demands that the country pass more of the same – his new “mini-stimulus.” Mr. Obama, it’s time to return to what demonstrably works, not continue what demonstrably doesn’t. Zero. That’s the number of net jobs created in America last month according to the Labor Department’s monthly update, and the unemployment rate remained at 9.1%. We are now more than two years since the recession officially ended in June 2009, and at the stage where the Obama Administration predicted that his trillion-dollar deficit spending “stimulus” would reduce unemployment to approximately 6% after topping out at 8% all the way back in the fall of 2009. Instead, we suffered a post-war record number of months over 9%, and it continues to fester there. By way of background, keep in mind that economists generally agree that a minimum of 150,000 to 200,000 jobs must be added to the American economy each month just to keep pace with natural population growth. Also consider that economists had forecast a rise of somewhere near 100,000 jobs for July. In contrast, in the same 30-month period following the effective date of President Ronald Reagan’s tax cuts in January 1983, unemployment plummeted from 10.4% to 7.4%. We know what economic policies actually work. What hath the opposite approach wrought? But more than a year later, Seattle’s numbers are lackluster. As of last week, only three homes had been retrofitted and just 14 new jobs have emerged from the program. 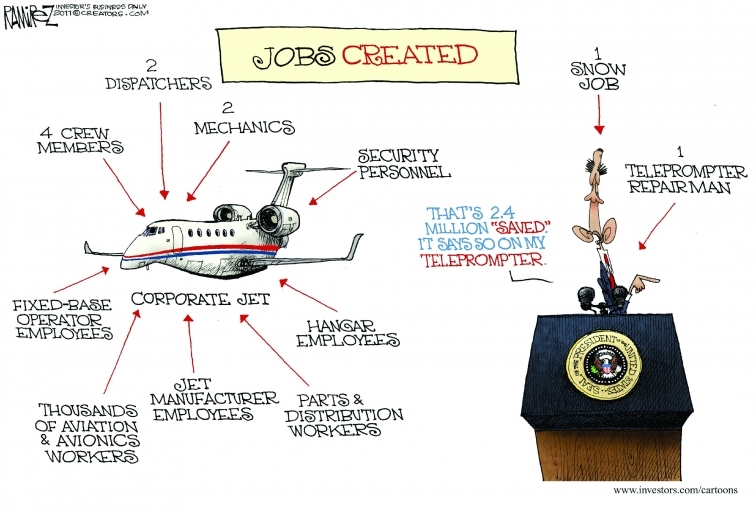 Fourteen jobs instead of 2,000. That means the Administration’s estimates were off by 99.3%. Since this president is so fond of telling us how much he respects the private sector, how about a few analogies from the real world? — A financial adviser with this level of accuracy would have invested $250,000 and ended up with $1,750. — A doctor with this level of accuracy who saw 850 patients a year would misdiagnose 844 of them. It’s more accurate to say that their spending and regulatory onslaught stifled our natural cyclical recovery and heaped more debt upon the American people. Today’s economic growth report card from the Commerce Department provided the latest evidence of that reality, as if any additional clarity was necessary. For the second quarter of 2011 (April through June), American gross domestic product (GDP) only grew 1.3%. That fell substantially below the expected 1.8% rate, which itself constitutes sluggish growth. Moreover, first quarter GDP was revised shockingly downward to 0.4% from its initial 1.9% estimate. That is simply pathetic and unacceptable. In comparison, the American economy jolted to life after Ronald Reagan’s very different response to the early 1980s recession (which was actually worse than the most recent recession, despite liberals’ persistent claims to the contrary). According to the Bureau of Economic Analysis, in the eight quarters since Obama’s wasteful “stimulus” in 2009, we’ve witnessed growth rates of 1.7%, 3.8%, 3.9%, 3.8%, 2.5%, 2.3%, 0.4% and now 1.9%. That’s an average of just 2.5%. But in the eight quarters following the effective date of the Reagan tax cuts, GDP exploded at rates of 5.1%, 9.3%, 8.1%, 8.5%, 8.0%, 7.1%, 3.9% and 3.3%. That’s an average of 6.7%. Today’s depressing report simply shows once again that lower taxes and less government create prosperity, while bigger government and more spending create stagnation. Unemployment Rises: At What Point Do Obama and Liberals Get the Signal? No, Mr. President. That’s precisely what the nation fears. We’ve already allowed you to go too far and do too much, but you’re apparently not getting the clue. For the month of June, unemployment unexpectedly rose to 9.2% and added a negligible 18,000 jobs, far below the 150,000 that economists had expected. That means the unemployment rate has risen from 7.8% when Obama signed his massive government spending “stimulus” to 9.2% over two years later. Keep in mind that his administration promised at the time that the “stimulus” would cap unemployment at 8% in the fall of 2009, and be down to around 6.5% by now. Instead, it rose all the way to 10.2% and has remained above 8% for a post-war record 29 consecutive months. Ignoring that, Obama and liberal pundits like Ezra Klein appearing on MSNBC’s “Morning Joe” claimed that what we need is even more of the same. At what point do they finally get the signal?